This is the top of the Ezee tree. This stunning all black electric bike has Shimano Alfine internal gears, Alfine hydraulic disc brakes and can get to 40km/h. The Torq Alfine is fitted with a genuine Shimano Alfine group set including front and rear Shimano Alfine hydraulic disc brakes, Alfine hydraulic brake levers, an Alfine chain tensioner and of course, the beautifully smooth Shimano Alfine 8-speed internally geared hub for pedalling bliss. The Torq Alfine comes standard with the L1000 super bright 1000 lumen front light. 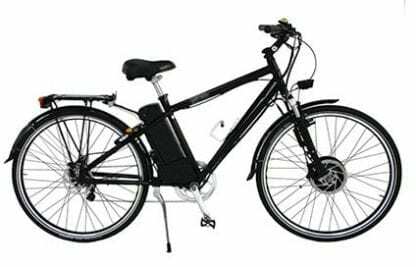 Comparable lights on non-electric bicycles sell for hundreds of dollars and require regular recharging at home, while the L1000 is powered by the electric bicycleصs battery. Other goodies include the AXA Defender wheel lock and the Pletscher dual leg kickstand. The Torq Alfine benefits from all the record-breaking, continent-crossing history and design of the Torq with the added luxuries of unbeatable stopping power and smooth, low maintenance drive chain. One ride and youصll be hooked. Motor: 200W Brushless DC hub motor with planetary gears (black).